Nguyen Hong Nhi              Nguyễn Hồng Nhị         8         2+2+1+1+1+1        921st „Sao Dao“ FR           1. Dang Ngoc Ngu                Đặng Ngọc Ngự           7         1+1+1+1+1+1+1      921st „Sao Dao“ FR    6      2. Ngo Ba Dich                  Ngô Bá Địch             7 [1+6]   ¼+¼+¼+¼+¼+¼+1                                   6. Le Thanh Dao                 Lê Thanh Đạo            6         1+1+1+1+1+1        927th „Lam Son“ FR           5. Nguyen Ngoc Do               Nguyễn Ngọc Độ          6 [5+1]   ¼+1+1+1+1+1        921st „Sao Dao“ FR           3. Luu Huy Chao                 Lưu Huy Chao            3 [1+2]   ¼+¼+1              923rd „Yen The“ FR    6, 8   4. Some sources present that Nguyen Hong Nhi was flying with 923rd Fighter Regiment (Taras, P.: Wietnam 1964-73, Walki nad DRW, Kampanie Lotnicze Nr. 2, A.J.Press 1994). 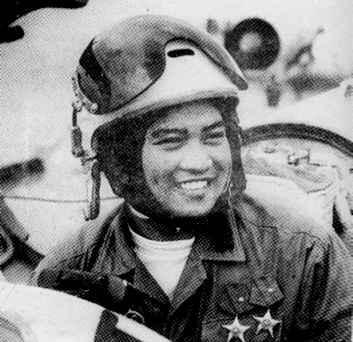 Some sources present that Dang Ngoc Ngu got 6 victories in total and that he was flying with 927th Fighter Regiment (Taras, P.: c.d.). Some sources present that Nguyen Ngoc Do was flying with 923rd Fighter Regiment (Taras, P.: c.d.). Some sources present that Luu Huy Chao got 8 victories in total (Taras, P.: c.d.). Some sources present that Le Thanh Dao was flying with 925th Fighter Regiment (Taras, P.: c.d.). May be some person as Nguyen Ba Dich. B-52 Stratofortress, Fly Past Special, Key Publishing, 2012. Bell, T. E.: B-57 Canberra Units of the Vietnam War, Osprey Combat Aircraft 85, Osprey Publishing, January 2011. Bernstein, Jonathan: US Army AH-1 Cobra Units in Vietnam, Osprey Combat Aircraft 41, Osprey Publishing, September 25 2003. Birzer, Norman W. - Mersky, Peter: US Navy A-7 Corsair II Units of the Vietnam War, Osprey Combat Aircraft 48, Osprey Publishing, September 23 2004. Boniface, Roger: Giant Killers, in FlyPast, No. 3, 2018. Brzkovský, Marek: Krupobití nad Vietnamem, in extra Válka Zbraně, No. 25, 2017. Brzkovský, Marek: Oceloví ptáci nad džunglí, MiG-17 vs. F-4 Phantom II, in Válka Revue Speciál, 3. srpna 2018. Brzkovský, Marek: Střipky z bojů nad Vietnamem, Kuriózní vzdušné operace, in Válka Revue Speciál, 3. srpna 2018. Brzkovský, Marek: Vánoční bombardování Hanoje, in Fakta & Svědectví, No. 12, 2018. Burgess, Rick - Rausa, Zip: US Navy A-1 Skyraider Units of the Vietnam War, Osprey Combat Aircraft 77, Osprey Publishing, March 2009. 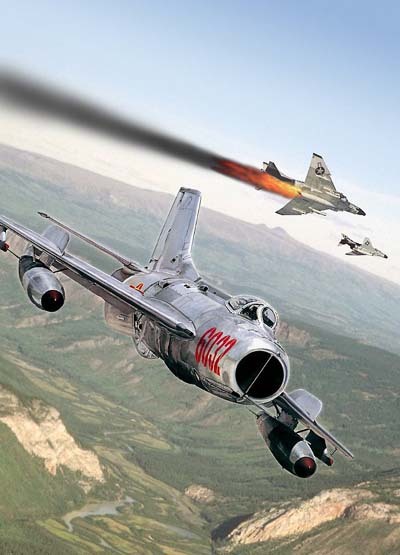 Buza, Zoltan: MiG-17 over Vietnam, in Wings of Fame, Vol. 8, Aerospace publishing/AIRtime. Buza, Zoltan - Toperczer, Istvan: MiG-19s in the Vietnam War, in Wings of Fame, Vol. 11, Aerospace publishing/AIRtime. Černý, Vladimír: Krvavé vánoce, Linebacker II 1972, in Válka Revue Speciál, 3. srpna 2018. Davies, Peter E.: USAF F-4 Phantom II MiG Killers 1965–68, Osprey Combat Aircraft 45, Osprey Publishing, May 25 2004. Davies, Peter E.: USAF F-4 Phantom II MiG Killers 1972–73, Osprey Combat Aircraft 55, Osprey Publishing, May 8 2005. Davies, Peter E.: F-4 Phantom II vs MiG-21, USAF & VPAF in the Vietnam War, Osprey Duel 12, Osprey Publishing, September 2008. Davies, Peter E.: F-4 Phantom II vs MiG-21, Válka ve Vietnamu, Osprey Duel - czech edition, Grada Publishing, Praha 2009. Davies, Peter E.: USN F-4 Phantom II vs VPAF MiG-17/19, Vietnam 1965–73, Osprey Duel 23, Osprey Publishing, November 2009. Davies, Peter E.: F-105 Thunderchief Units of the Vietnam War, Osprey Combat Aircraft 84, Osprey Publishing, February 2010. Davies, Peter E.: F-105 Wild Weasel vs SA-2 ‘Guideline’ SAM, Vietnam 1965–73, Osprey Duel 35, Osprey Publishing, May 2011. Davies, Peter E.: Republic F-105 Thunderchief, Air Vanguard 2, Osprey Publishing, September 18, 2012. Davies, Peter E.: US Marine Corps F-4 Phantom II Units of the Vietnam War, Osprey Combat Aircraft 94, Osprey Publishing, November 2012. Davies, Peter E.: USAF McDonnell Douglas F-4 Phantom II, Air Vanguard 7, Osprey Publishing, April 23, 2013. Davies, Peter E.: F-105 Thunderchief MiG Killers of the Vietnam War, Osprey Combat Aircraft 107, Osprey Publishing, October 2014. Davies, Peter E.: USN McDonnell Douglas F-4 Phantom II, Air Vanguard 22, Osprey Publishing, March 22, 2016. Davies, Peter E.: US Navy F-4 Phantom II Units of the Vietnam War 1964-68, Osprey Combat Aircraft 116, Osprey Publishing, 25 Aug 2016. Davies, Peter E.: B-52 Stratofortress vs SA-2 "Guideline" SAM, Vietnam 1972–73, Osprey Duel 89, Osprey Publishing, 18 Oct 2018. Davies, Peter - Menard, David: F-100 Super Sabre Units of the Vietnam War, Osprey Combat Aircraft 89, Osprey Publishing, August 2011. Drendel, Lou: Thud, Modern Military Aircraft series, No.5004, Squadron/Signal Publications, First Edition edition, 1986. Drendel, Lou: ...And Kill Migs, Air to Air Combat From Vietnam To The Gulf war, Squadron Signal Publications, No. 6072, 1997. Elwald, Brad - Davies, Peter: US Navy F-4 Phantom II MiG Killers 1965–70, Osprey Combat Aircraft 26, Osprey Publishing, November 25 2001. Elwald, Brad - Davies, Peter: US Navy F-4 Phantom II MiG Killers 1972–73, Osprey Combat Aircraft 30, Osprey Publishing, August 19 2002. Emerson, Stephen: Air War Over North Vietnam, Operation Rolling Thunder, 1965–1968, Pen and Sword Military, 2008. Ferkl, Martin: Mozaika MiG-21, Zajímavosti o letounech, které byly předlohou pro aktuální edice MiGu-21MF 1/48 od Eduardu, in Info Eduard, Volume 11, Issue 3, March 2011. Гордон, Ефим И.: В тени старшего брата, in Авиация и время, № 4 (36), 1999. Grandolini, Albert: Le coup de faux des “Phantom” II, L’opération Bolo au Viêtnam, le 2 janvier 1967, in Le Fana de l'Aviation, No. 1, 2017. Grandolini, Albert: Operation Bolo & Project Silver Down, in The Aviation Historian, Issue Number 21, October 2017. Guttman, Jon: Aus Gegnern wurden Freunde, Phantom gegen MiG-21, in FliegerRevue X, Nr. 045, . Hallion, Richard P.: Rolling Thunder 1965–68: Johnson's air war over Vietnam, Air Campaign 3, Osprey Publishing, February 20, 2018. Hobson, Chris: Vietnam Air Losses: United States Air Force, Navy and Marine Corps Fixed-wing Aircraft Losses in Southeast Asia 1961-1973, Midland Publishing / Specialty Press, First edition, 2001. Hukee, Byron E.: USAF and VNAF A-1 Skyraider Units of the Vietnam War, Osprey Combat Aircraft 97, Osprey Publishing, February 2013. Иванов С.Н. : Боевое применение МиГ-21 во Вьетнаме, Война в воздухе № 22. Якубович, Николай: Первые сверхзвуковые истребители МиГ-17 и МиГ-19, Война и мы. Авиаколлекция, Издательства: Яуза, Эксмо, 2014 г.
Кузнецов, Константин Александрович: Стратегический бомбардировщик В-52 «Стратофортресс», 65 лет в воздухе, Война и мы - Авиаколлекция, Эксмо / Яуза, 2017. Lake, Jon: B-52 Stratofortress Units in Combat 1955–73, Osprey Combat Aircraft 43, Osprey Publishing, January 22 2004. Lake, Jon: North American F-100 Super Sabre, in International Air Power Review, Volume 11, 2004. McCarthy, Donald J., Jr.: MiG Killers: A Chronology of U.S. Air Victories in Vietnam 1965-1973, Specialty Press Publishers & Wholesalers, 2009. Mersky, Peter: F-8 Crusader Units of the Vietnam War, Osprey Combat Aircraft 7, Osprey Publishing, August 28 1998. Mersky, Peter: RF-8 Crusader Units over Cuba and Vietnam, Osprey Combat Aircraft 12, Osprey Publishing, March 1 1999. Mersky, Peter: US Navy and Marine Corps A-4 Skyhawk Units of the Vietnam War 1963–1973, Osprey Combat Aircraft 69, Osprey Publishing, May 2007. Mersky, Peter: F-8 Crusader vs MiG-17, Vietnam 1965-72, Osprey Duel 61, Osprey Publishing, November 2014. Michel, Marshall L., III: Clashes: Air Combat over North Vietnam 1965-1972, US Naval Institute Press, 1997. Michel, Marshall L., III: Operation Linebacker II 1972, The B-52s are sent to Hanoi, Air Campaign 6, Osprey Publishing, Sep 20, 2018. Michel, Marshall L., III: Operation Linebacker I 1972, The first high-tech air war, Air Campaign 8, Osprey Publishing, January 22, 2019. Mladenov, Alexander: Mikoyan-Gurevich MiG-21, Air Vanguard 14, Osprey Publishing, June 17, 2014. Morgan, Rick: A-6 Intruder Units of the Vietnam War, Osprey Combat Aircraft 93, Osprey Publishing, December 2012. Morgan, Rick: A-3 Skywarrior Units of the Vietnam War, Osprey Combat Aircraft 108, Osprey Publishing, 20 Mar 2015. Pospíšil, Martin: McDonnell F-101 Voodoo, průzkumné verze - operační služba v Evropě, Tichomoří a Jihovýchodní Asii, in REVI Publications, No. 109, prosinec 2017. Šajtar, Jaroslav: Čtvrtá nejkrvavější, in ATM, No. 4, 2010. Taras, Piotr: Wietnam 1964-73, Walki nad DRW, Kampanie Lotnicze Nr.2, A.J.Press 1994. Tillman, Barrett: MiG Master, The Story of the F-8 Crusader, Naval Institute Press, 2nd edition, 2014. Tomša, Rudolf: MiG-21F a jeho licenční varianty, II. diel, Bojové nasadenie, in Plastic Planet, No. 3, 2014. Tomša, Rudolf: MiG-21F a jeho licenční varianty, III. diel, Bojové nasadenie, in Plastic Planet, No. 4, 2014. Toperczer, István: MiG-17 and MiG-19 Units of the Vietnam War, Osprey Combat Aircraft 25, Osprey Publishing 2001. Toperczer, István: MiG-17/19 Aces of the Vietnam War, Aircraft of the Aces 130, Osprey Publishing, 20 Oct 2016. ACIG Team: Vietnamese Air-to-Air Victories, Part 1, List of confirmed, claimed, and probable air-to-air victories scored by the Vietnamese pilots April 1965 - December 1968, http://www.acig.info/CMS/index.php?option=com_content&task=view&id=243&Itemid=47. ACIG Team: Vietnamese Air-to-Air Victories, Part 2, List of confirmed, claimed, and probable air-to-air victories scored by the Vietnamese pilots between January 1968 and December 1972, http://www.acig.info/CMS/index.php?option=com_content&task=view&id=244&Itemid=47. Cooper Tom: 10 May 1972: Reconstruction of an Air Battle, http://www.acig.info/CMS/index.php?option=com_content&task=view&id=231&Itemid=47. Cooper, Tom: Headless Fighters: USAF Recconnaissance-UAVs over Vietnam, http://www.acig.info/CMS/index.php?option=com_content&task=view&id=236&Itemid=47. Lednicer, David - Camp, Adrian: US Air-to-Air Losses in the Vietnam War, http://myplace.frontier.com/~anneled/usloss.html.